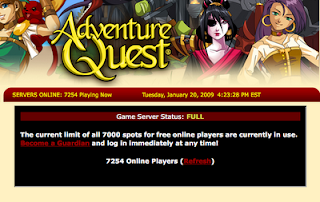 Well, it seems I won't get any further with my Battleon (see part 1, 2, and 3) adventures, because ... of the message on the left > current limit of all 7000 spots for free online players are currently in use < I know by experience that the number of players is nearly 8000 everyday. So ... fair enough ! You can beat dragons, wizards, etc ... but you can't compete with that.